Released in 2001, ICO is still the game most likely to be included by reviewers in a sentence with the word "art." It stars the titular character, a boy who is to be sacrificed because of the horns on his head. After being left to die in a remote castle, he soon meets an almost ethereal girl named Yorda. The two of them must then work together in an attempt to escape from the castle. Best time: 1:45:25 by Kevin 'Enhasa' Juang on 2006-03-11. Best Single-segment: 1:51:04 by Kevin 'Enhasa' Juang on 2006-03-21. This run is about 12 minutes faster than the previous "world record" Japanese time. I could probably save 1-2 minutes if I wanted to redo this. At first, I didn't think this could even reach 1:55, so it's pretty funny that this run beats that even after including the credits and ending. Especially since being relatively linear, you wouldn't think there would be many ways to save time in ICO. I put a lot of effort into these runs. Basically, from mid December to near the end of March, this was the only game I played. I originally expected to be able to do this in a weekend, so go figure. 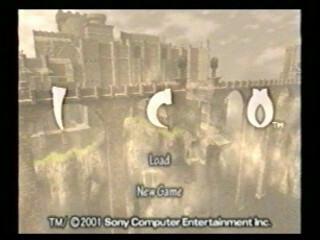 Anyway, it's torture for me to not be able to play anything new, but I love ICO so much that I was able to keep to it. I am going to take a little break from running to catch up on my pretty big backlog of games I haven't played yet. I'll be honest up front; 3D action games are certainly not my forte. Copying my route, you could probably train a top SotC player to beat my times without too much difficulty. I love planning RPG runs, and I am proud to say that the good amount of time that I save comes from more optimized routes. In particular, hopefully you will enjoy some of the time saving tricks that I put in there. I don't want to spoil anything, but I think an especially unique trick occurs in the chandelier room. I did this run before the SS one, so there are a couple tricks I discovered/implemented there that I didn't here: throwing the bomb to get to the graveyard, and cutting two ropes at a time in the towers. Anyway, this is faster segmented because I got to make sure that I got pretty good luck, and there shouldn't be any big time-wasting mistakes. The reason why I don't use more segments is because the very act of saving wastes some time. Feel free to offer any suggestions, but know that I have played and tested this game obsessively. There are probably many instances that look like minor mistakes but aren't, and some very minor mistakes than probably only I would notice. For example, it is possible (albeit risky) to jump onto ladders instead of climbing from the bottom, but it is actually slightly slower. One thing that I tested for about 45 minutes to an hour, was the effect of jumping. Despite my first intuition, I am pretty sure that in fact, jumping and running take exactly the same amount of time. If there is a difference, it is too minute to notice after even 30 second stretches. However, there are some reasons to jump for speed: 1) when carrying a bomb; 2) to avoid climbing animation time; 3) to reduce acceleration time from zero; 4) to maintain horizontal velocity when falling off cliffs; 5) if you can chain multiple jumps, since the delay upon landing is mitigated. The last one is a bit of an enigma because it seems nobody knows how to actually do it. I personally just mash triangle; I tested with a turbo controller and that doesn't work. Anyway, this means that I want to jump on stretches if and only if I would like to be able to at least double jump. I try very hard to stick to this, although if there is high enough danger of double jumping to death or catching onto an unwanted platform, it's better for me just to run. There are quite a few differences between the different region versions of this game, and it is widely known that the EU version has many nice extras and better packaging. There are some advantages when it comes to speedrunning, however. - Most importantly, if you set the framerate to 50 Hz, there is a glitch where you can do a superjump (much farther, one "block" higher) by hitting square right after you hit triangle to jump. This allows massive sequence breaking, such as in the room just beyond the crumbling bridge, you can go straight forward instead of up the rising stairs, then jump across the gap to skip all the way to the chandelier room. And so forth. I've never played the EU version, but based on these factors, I think that closer to an hour flat is a relatively decent estimate to shoot for, depending on just how much sequence breaking is possible. Single-segment 1:51:04 by Kevin Juang. A minimalist game deserves (relatively) minimalist comments. Read the segmented run comments for aspects that apply to both runs. This is several minutes faster than the previous best known world record, which was done by some Japanese guy SEGMENTED. I think that if everything went perfectly, I could do sub 1:45. However, it would probably take me at least another three months of recording, and I don't have that kind of time or patience. I make three sizable, blatant mistakes, which cost about 2 minutes combined. Deciding not to attempt skipping the last skippable fight cost a little over another minute. Finally, I get bad luck in the room right before the windmill, costing 3 minutes. And when I mean bad luck, I really do mean luck. I don't think there's a better way to play "hold onto R1 after a cutscene." During that section, I play a bit on tilt and get juggled 7 times in a row (!) and almost die. But I kept on going because amazingly, the shadow skip right before that (the riskiest part of the entire run) went perfectly.